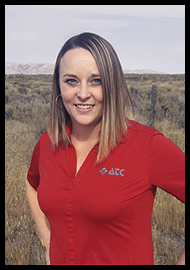 Sharese was born and raised in the Lost River Valley, and came to work as ATC’s “Diligent Doer” in 2017. Having worked in the sales arena for much of her career, Sharese’s “people-person” personality is evident to everyone she meets after just a few minutes of conversation. She is light-hearted, laughs easily, and is always looking for fun project to work on. In her free time, Sharese loves spending time with her two adorable daughters, riding ATV’s with her family, and reading the latest Steven King novel. She loves Dr. Pepper, any kind of coffee, seafood, and politics! Sharese also stays busy serving on her local School Board and Community Parks and Recs organization. We’re thankful to have this hands-on, challenge-loving, customer service representative on our ATC team.